Is there a better alternative to One Finger Snap? Is One Finger Snap really the best app in Contextual Menus category? Will One Finger Snap work good on macOS 10.13.4? 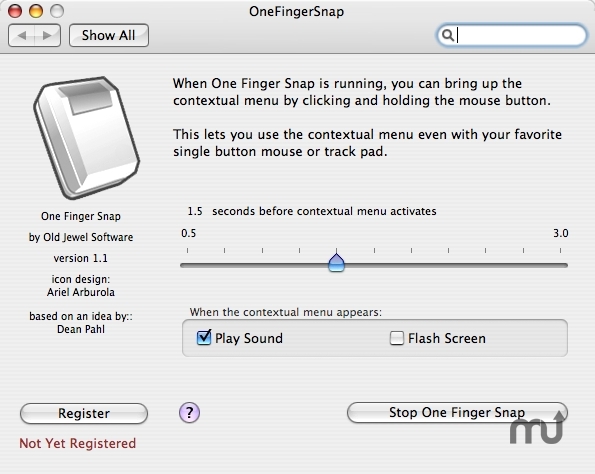 One Finger Snap is a Preference Pane that brings up the contextual menu whenever you click and hold down the mouse button. This means that you can do everything with a single-button mouse that you can do with a 2-button mouse. Don't throw away that 1-button mouse. Don't carry around a clunky mouse with your powerbook. Don't think that you've lost a second mouse button when you switch from that other OS. Just click and hold wherever you would normally right-click. One download link is for the preference pane itself, the other is for the source. One Finger Snap is now open source under the MIT License. One Finger Snap needs a rating. Be the first to rate this app and get the discussion started!